WANTED parties like it’s 1999… again. Home » action • cinema reviews • sci-fi • text reviews » WANTED parties like it’s 1999… again. It’s been the eternal question on no one’s lips: what would happen if The Matrix and Fight Club had a baby? At least now, we know it would be Wanted… a high octane, man-up, power to the people bootstrap bonanza that embraces its utter absurdity with relish. Y2K was in full swing, and movies were both fun roller coasters and bleak commentary all at the same time. It was 1999, and two anthem movies for men hit the market: The Wachowski Brothers blended conversion, Christ, and Buddhism into a magnum opus Matrix that fueled testosterone, visual effects, coffee-conversation and even sermons (the least interesting things it spawned were two tepid sequels). Meanwhile, David Fincher‘s adaptation of Chuck Palahniuk‘s Fight Club took a stab at our confusion in regard to masculinity, merchandising, therapy, social expectations, fragmented personalities and terrorism. From Brad Pitt’s semi-sermon about being in a “spiritual war” to Morpheus’ pill-popping, reality-bending revelation for Neo, cubicle dwellers responded with cheers and excitement at the idea that life had more purpose and meaning, and that they didn’t need to be lemmings scurrying around in an dehumanizing, politically correct landscape. All was well with the world? It’s now 2008, and not surprisingly most of those men are still in the cubicles, pacified and subdued by Swedish furniture and how many friends they have on Facebook, tapping at their ergonomic keyboard and complaining about carpal tunnel. Whether they are secretly yearning for that dream of sweet release again will soon be evident, as Wanted seeks to deliver two hours of fleeting hope to the emasculated masses. Adapting the graphic novel of the same name, the film takes the comic book property and borrows heavily from the style of The Matrix and the male empowerment theme of Fight Club, with a splash of another 1999 classic – Office Space. Some would also describe it as this year’s Shoot ‘Em Up, but in any case it’s a familiar superhero romp with a character who gives the finger to his own internal weakness, his dead-end job, his cheating girlfriend, his waste of a friend, and pretty much ALL the powers that be. Much like this years apocal-epic Doomsday, it seems more like an homage to successful films that have come before it… but this one succeeds in probably being the film that is the most fun this year, save for the crowd-pleasing Iron Man. 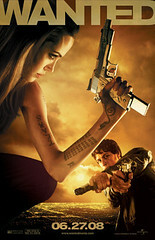 25 year old office drone Wesley Gibson (James McAvoy) is meandering through his meaningless life when he meets Fox (Angelina Jolie), an intense woman who pushes him out of the way of gunfire and engages in a spectacular shoot-out. She informs Wesley that the attacker has already killed his father, who was apparently the greatest assassin in “The Fraternity”, an ancient order that carries out assassinations based on a mysterious system of fate. Wes learns quickly that he has been wasting his life, that he has the ability to curve bullets and the inherent gifting to literally shoot the wings off of a fly. Brought into the assassins’ fold, the Fraternity helps the previously oblivious man hone his dormant powers… not just to join them in killing people as the “loom of fate” decrees, but so that he can avenge his father’s death. However, like any good fast-paced action movie, Wesley soon learns there is more going on in The Fraternity than meets his sharpshooting eye. The foundational ideas the film toys with (amidst gunfire, fisticuffs, and car chases) are “living a lie” and the inevitability of “fate”. Wesley believed the world operated in a particular, mundane way, walking along like everyone else until a stunning moment of revelation revealed the truth of the world… that there is much more to his existence, a larger narrative arc to life and everything in it. He realizes His father and his own destiny are things he never considered (or never wanted to admit). This is not unlike the experience a Christian describes, coming to an awareness of the true metanarrative overarching human existence… that humans are more than mud and cells and abiogenesis and ultimately the grave: that our beginning, and our end, and our hero, all pivot on the cross, divinity, victory and person of Jesus Christ. Like Wesley, I was 25 when overwhelming revelation irrevocably changed my life. While not marked by curved bullets, curvaceous assassins and abandoned factories, the overturning of “normal” is the experience of the transformed believer. At one point in the film, Wesley literally struggles his way through a demolished loom and its scrambled threads, which takes on the appearance of a spider-web; for all intents and purposes he is tangled in a “web of fate”. The movie not only implies some kind of intelligent design to the fabric of existence, but that – no matter what we do – fate will catch up with us. Though Wesley is freed from his former life, we begin to see on multiple levels that he has been carefully and meticulously led into this “freedom” and that certain ends seem inevitable. This facet of the film begs the question: how much control do we have over our lives, and who is pulling the strings? Are we a slave to our design? Is there a designer? Is there someone weaving us into a narrative from which there is ultimately no escape? Can we trust in it, or them? 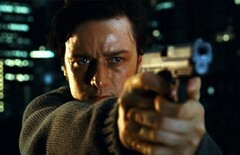 McAvoy is not as nimble in Norton was in Fight Club, providing voice-overs about his pathetic life and evolving from wimp to warrior, but he is functional and fully enjoyable. Honestly, he’s more versatile and accessible than Keanu Reeves’ Neo with that stunned look and “whoa”. As Fox, Angelina Jolie does a tremendous job transmitting much more while saying much less; rumor is she cut many of her lines believing her character would communicate through expression, and it pays off. This time, less is truly more. 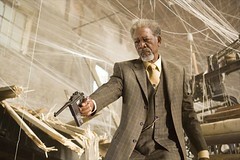 Morgan Freeman appears as Fraternity head Sloan and delivers the quality we expect from this veteran even when he’s in an essentially silly movie. Russian director Timur Bekmambetov brings a relentless rhythm to the film that keeps the audience excited and smiling. If you like the films it borrows from heavily, you will likely enjoy Wanted.